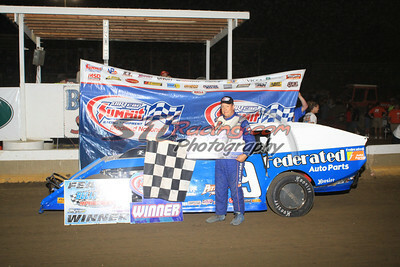 BELLEVILLE, Ill. – June 29, 2011 – NASCAR veteran Ken Schrader tied Mike Harrison for the most wins in the	DIRTcar Summit Racing Equipment Modified Nationals Wednesday night, earning his third win of the 2011 tour at Belle Clair Speedway. Schrader started on the outside pole and surged to the lead holding off Tim Hancock of Mt. Olive, Ill., and Steve Lach of Brownstown, Ill., over the course of 30-laps to earn the $1,000 top prize. Schrader’s win boosts him to 7th in the points standings on the strength of three feature wins in the three events he’s raced in so far during the month-long tour. Paul Bauman of Zell, Mo., finished fourth, as Jimmy Cummins of Waterloo, Ill., rounded out the top five. DIRTcar Summit Racing Equipment Modified Nationals points leader Jeff Curl of Forrest, Ill., finished 10th in the evening’s main event opening up his points lead to 47 markers over John DeMoss of Bloomington, Ind. Click this link for more news and information about the DIRTcar Summit Racing Equipment Modified Nationals. Heat race wins went to Bauman, Schrader and Harrison. Dean Hoffman of hometown Belleville, Ill., won the event’s B-Main. The Summit Racing Equipment Modified Nationals return to action Thursday, June 29, at Clay Hill Motorsports Park in Atwood, Tenn.
A-Main (30-Laps): 1. 9 Ken Schrader ($1,000), 2. 1 Tim Hancock, 3. 42 Steve Lach, 4. 24 Paul Bauman, 5. 19 Jimmy Cummins, 6. 25 Brett Korves, 7. 15 Chris Smith, 8. 89 Bobby Bittle, 9. 428 Mike Haas, 10. 12 Jeff Curl, 11. 42 McKay Wenger, 12. 17 Jesse Wisely, 13. 87 Zeb Moake, 14. 808 Kelby Simmons, 15. 84 Tyler Diebert, 16. 55 Brad Venhaus, 17. 8 Brendan Bittle, 18. 1D Dean Hoffman, 19. 28 Tom Smallwood, 20. 24 Mike Harrison. June 30 Clay Hill Motorsports Park Atwood, Tenn.
July 1 Paducah International Raceway Paducah, Ky.
July 2 I-55 Raceway Pevely, Mo. July 3 Lincoln Speedway Lincoln, Ill.
July 6 Peoria Speedway Peoria, Ill.
July 7 Macon Speedway Macon, Ill.
July 8 Farmer City Raceway Farmer City, Ill.
July 9 Clarksville Speedway Clarksville, Tenn.
July 10 Tri-State Speedway Haubstadt, Ind. July 12 Brownstown Speedway Brownstown, Ind. July 13 LaSalle Speedway LaSalle, Ill.
July 14 Spoon River Speedway Canton, Ill. The DIRTcar Summit Racing Equipment Modified Nationals is brought to fans by several sponsors and partners including Summit Racing Equipment, Hoosier Racing Tires, GM Performance Parts, University of Northwestern Ohio, Aero Race Wheels, ASI Racewear, Auto Meter, Bell Helmets, Beyea Custom Headers, Bilstein Shocks, Fast Shafts, Fusion Graphics & Sign Company, Intercomp, Racing Electronics, Vicci, Chizmark Larson Insurance, KSE Racing Products, MSD Ignition, QA1 Motorsports, Quarter Master, R2C Competition Series Air Filters, RacingJunk.com, Willy’s Carburetor & Dyno Shop, VP Racing Fuels.